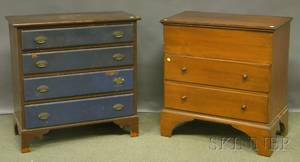 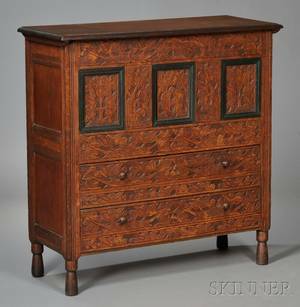 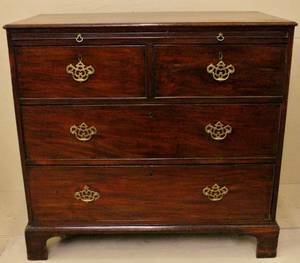 34 1/2"H x 36 1/2"W x 19 1/4"D.
English bow front chest; french feet, two over two drawer configuration, ca. 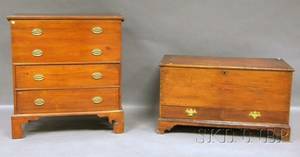 1800; 18" x 34 1/2" x 34"
Pine Dovetail-constructed Blanket Chest with Two Short Drawers and a Pine Blanket Chest over Two Long Drawers. 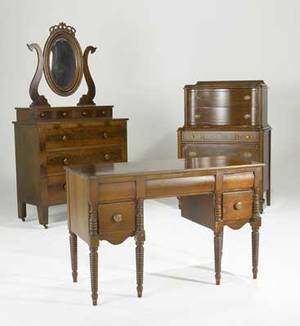 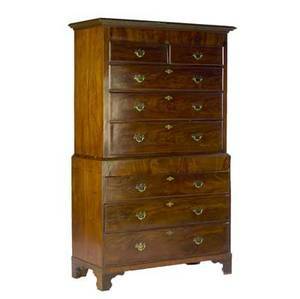 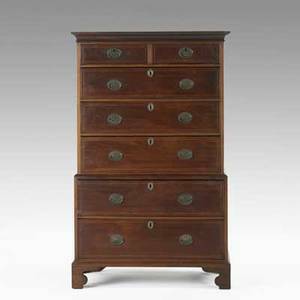 George iii chest on chest; mahogany, two over six graduated drawers with oval brasses, bracket feet, england, ca.1800; 74" x 44" x 22 1/2"
Georgian chest on chest; mahogany with line inlay, oval brasses and two over five drawer configuration, 19th c.; 58" x 36" x 22 1/2"
Traditional furniture; empire two over four drawer mahogany chest with reeded columns together with pembroke pine drop-leaf table, 19th c.; chest: 45" x 44" x 20 1/2"
Traditional furniture; empire mahogany two over four drawer chest together with single pedestal kneehole desk; chest: 51 1/2" x 44 1/2" x 21"
Traditional furniture three pieces in mahogany include empire mirrored chest of drawers, two over three drawer louis xxi style chest and vanity with rope-turned legs. 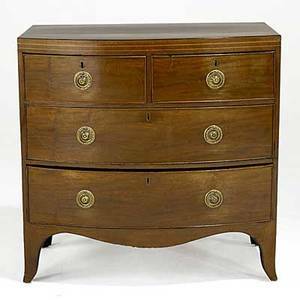 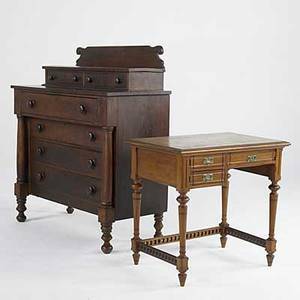 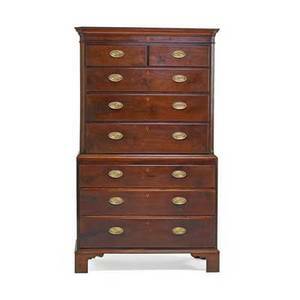 largest: 75 1/2" x 41" x 18 1/2"
English mahogany chest on chest, late 18th c. two-over-six drawer configuration, chippendale brass pulls and bracket feet. 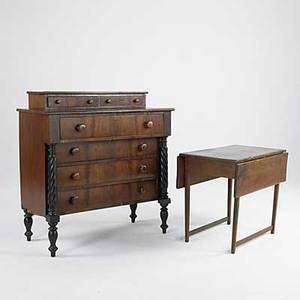 77" x 45 3/4" x 21"